Wow, it's been a long time since I posted pictures of new goodies that weren't magazines. Some nice things arrived this weekend so it seemed like a good opportunity to take a few pictures. 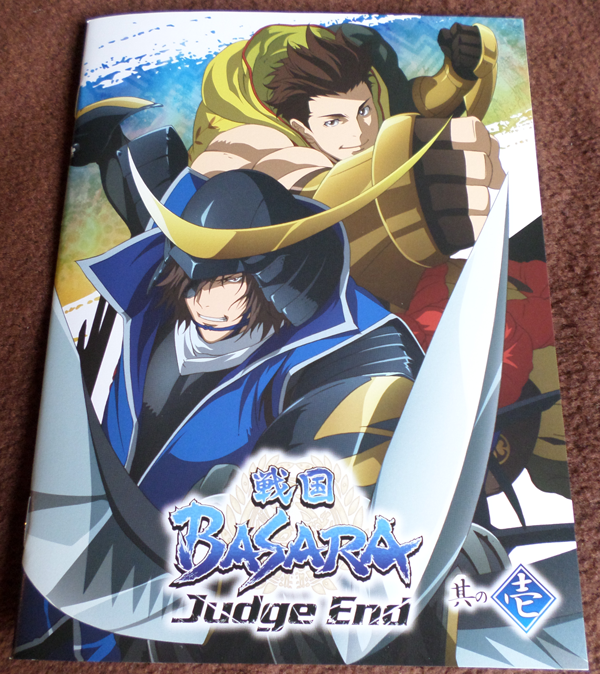 To start off, here's the first Japanese Blu-ray set for Sengoku Basara Judge End. 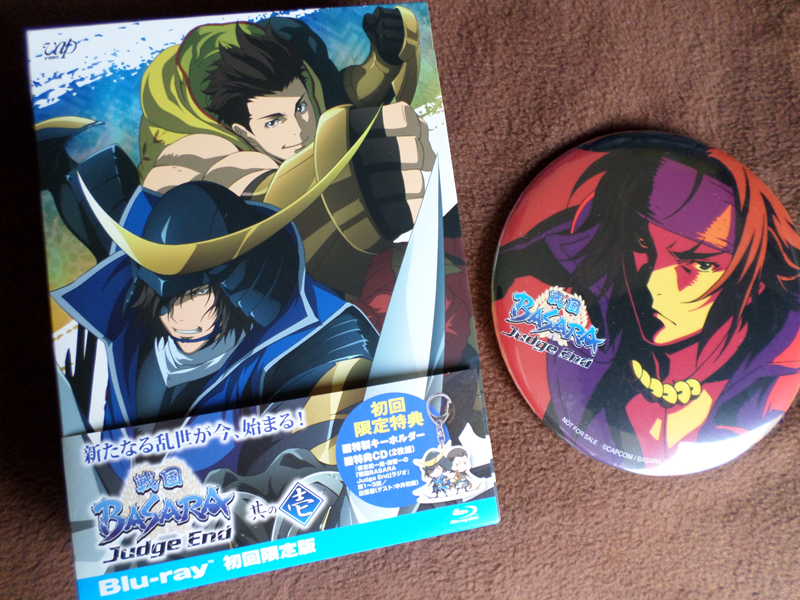 I purchased through Amazon Japan so the set included an exclusive oversized Yukimura badge. I'm never sure what to do with things like this; at least it looks cool. The wraparound paper obi keeps everything together until you open it up. First of all, I looked inside the Blu-ray slipcase. 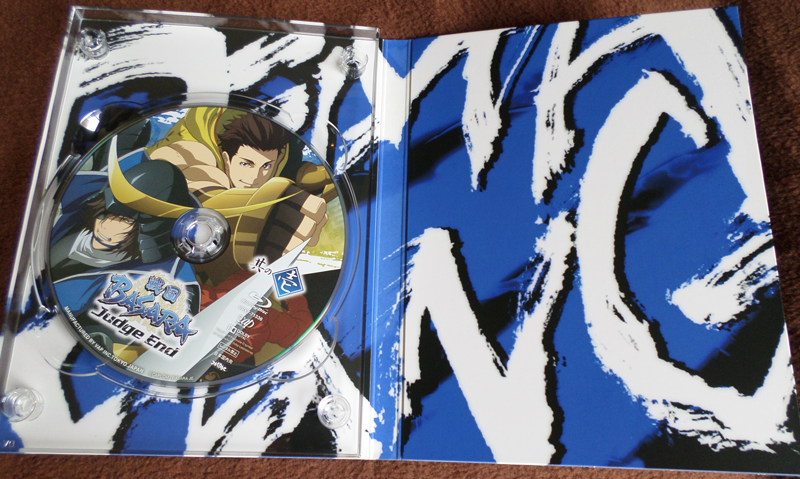 It contains a full-colour booklet with character designs and basic information about the series. The slipcase also contains the colourful Digipak which holds the Blu-ray disc. It's certainly eye-catching! 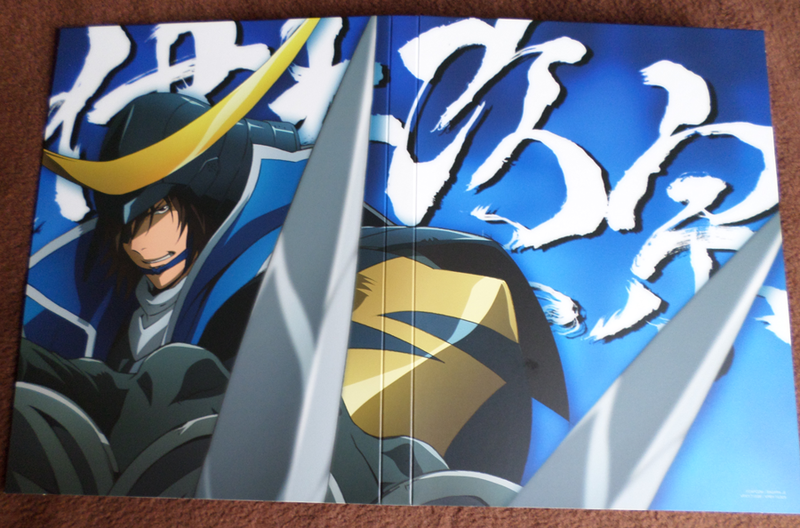 The other side of the Digipak is dedicated to Masamune. Since there will be four volumes in total, I guess each will be themed around one of the four leads. 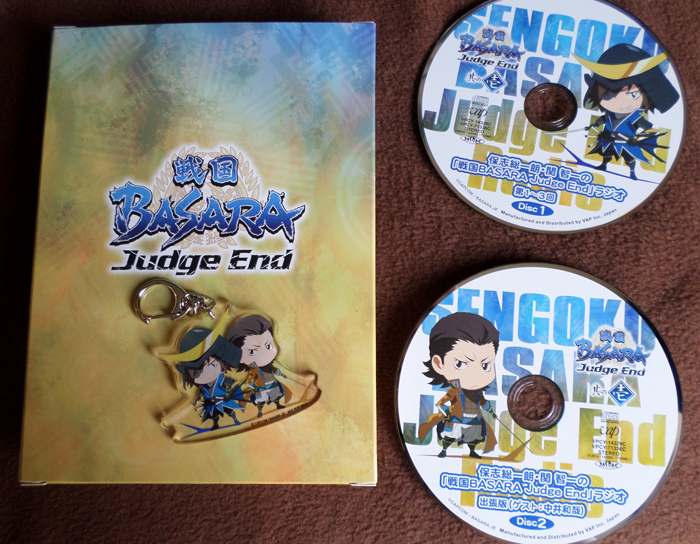 Pressed up against the Blu-ray slipcase is a thin cardboard box which contains the first press bonus items: a Masamune/Kojuurou keychain and two bonus audio CDs for the radio show. I'll listen to the exclusive episode on the way to work this week. As for the Blu-ray disc itself, it's wonderful to be able to watch these episodes properly instead of in the poor quality that my online stream provided. The Blu-ray version looks so much better. I hope FUNimation use the same video materials when they create the US edition instead of messing with things. The on-disc extras are limited to textless opening/ending sequences and an audio commentary for the first episode. 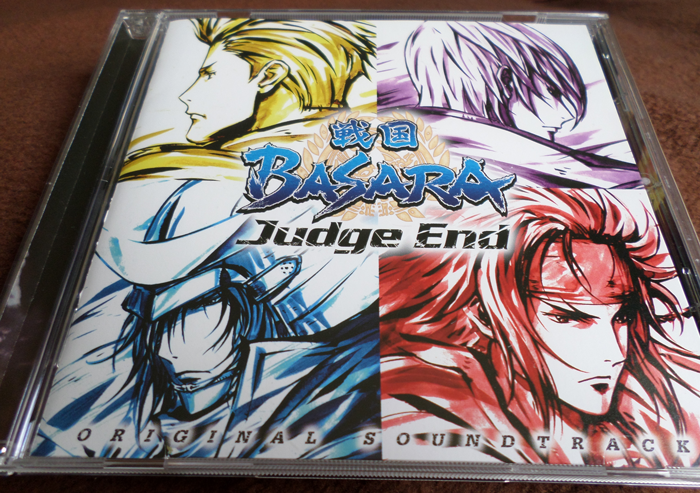 My shipment also included a few CDs, starting with the Sengoku Basara Judge End Original Soundtrack. I've become rather fond of Tokuda Masahiro's score. It's different to Sawano's sweeping masterpiece used in the old anime, and it's less action-packed than the game soundtracks. In spite of this, it's very pleasant to listen to. Kimi Janakya Dame Mitai by Ooishi Masayoshi was the chipper opening to Gekkan Shoujo Nozaki-kun, and Namae No Nai Kaibutsu by EGOIST served as the first ending to PSYCHO-PASS. The latter isn't exactly new, but I watched the show for the first time recently and fell in love with the song. 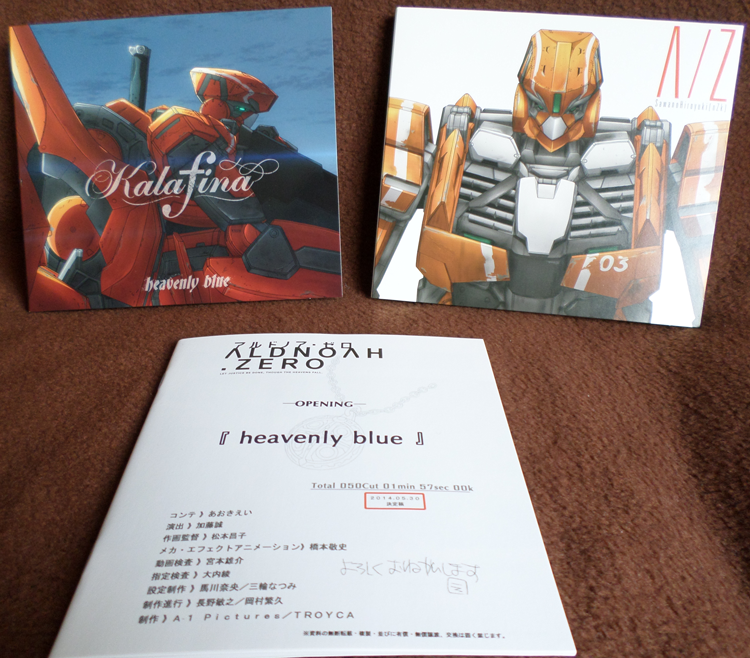 Kalafina's heavenly blue and Sawano Hiroyuki's A/Z | aLIEz CDs covered the opening and closing songs from last season's Aldnoah Zero anime. 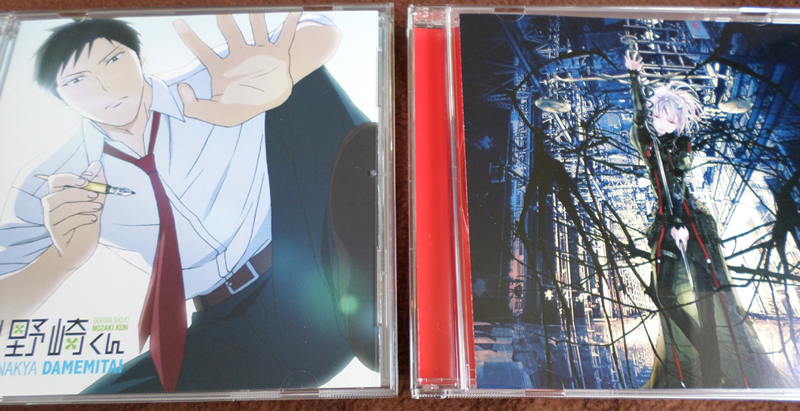 I'd like to pick up the full soundtrack as well when I get the chance since the insert song BRE@TH//LESS is gorgeous. The heavenly blue single included a pamphlet with storyboards for the opening, which was an interesting bonus. A/Z | aLIEz featured a bonus DVD with the textless end credit sequences from the anime. The last items on the list are a pair of drama CDs. 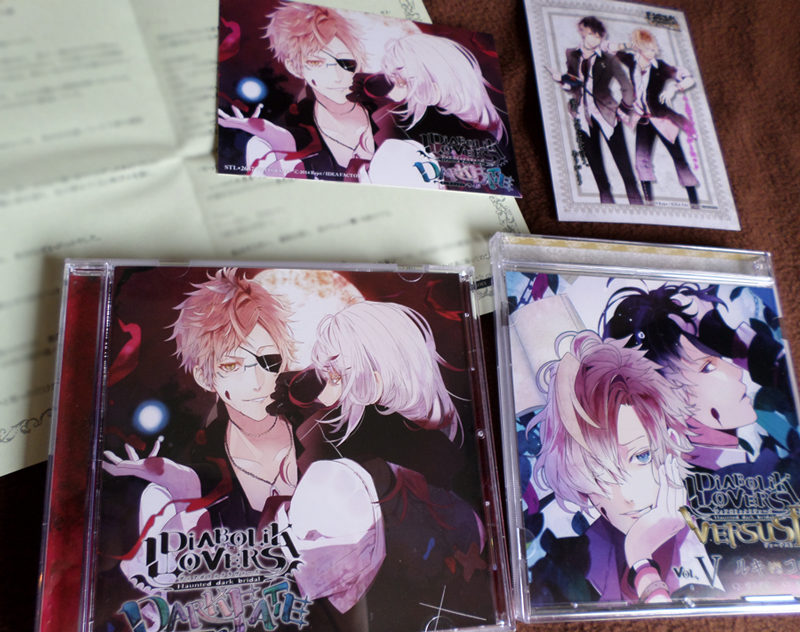 Diabolik Lovers do-S Kyuuketsu CD: VERSUS II Vol. 5 came with Animate's special bromide as a bonus while the first Dark Fate CD's extras were a bromide and short story pamphlet from Stellaworth. I've been trying to save money recently but I ordered all of this quite some time ago. It was difficult waiting for the new CDs after hearing the themes playing each week as part of their anime broadcasts. "The Blu-ray version looks so much better. I hope FUNimation use the same video materials when they create the US edition instead of messing with things." Do you mean that the animation quality itself has been improved for the video release or that it just looks better than a fuzzy online stream? It was impossible to take pictures of the best action scenes because they were so blocky. FUNimation's stream is probably already better than that, so I'm just hoping they make the BD look good and don't use materials with weird video effects like they did with PSYCHO-PASS. OK, would have been awesome if they had made some improvements but it's good to hear that it looks good anyway. Haha, yeah, it was his first anime soundtrack (though he's composed for other mediums before) so I think he did rather well!